Studies show that non-profits and charitable organizations lose a great deal of manpower and donations by not having clear and concise ways for patrons to join. By making the sign up process as easy as possible for people to take advantage of, they have no excuse not to join. The mind is a funny tool, and experts suggest that many people want to take advantage of such situations, but as soon as an obstacle presents itself, these same people are much less likely to jump at it. Cut out all of the obstacles by making the volunteer process as straight forward as possible with a volunteer sign up sheet. If you are planning an event, you likely have a huge list of items already on your plate. 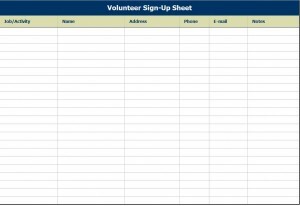 Scratch one of those items off your list by getting your hands on a volunteer sign up sheet template. The best part about these volunteer sign up sheets is that they are absolutely free! You pay nothing to get your hands on these volunteer sign up sheets, so like the patrons you are getting to sign up, you have nothing to lose. If you are at all computer savvy, you can make sure that you get the most of your work by customizing the sheet to your specifications. This volunteer sign up sheet can be changed to your whim, so that you can change all titles, grids and number of selections. This way, you can add specific information to your cause, in addition to blocking out a specific number of volunteers if you have a certain number you are shooting for. To make things more fun, you can split up your volunteers into groups, such as the “red team” or “blue team”, or make it more specific by outlining particular jobs that people can sign up for, including “concessions”, “trash cleanup” and “cooking”. You have nothing to worry about in terms of getting your hands on this volunteer sign up sheet template, because you can easily download it, as long as you have an internet connection. Once you download this template, it is yours, so make sure that you do everything in your power to get this baby printed out or added to your web site in enough time to gather the amount of volunteers that you need. The template is free and readily available, so make sure to visit the site and get started.